Seriously, I had no idea Kuopio Dance Festival (KDF) would be this cool. It feels like the whole city has been taken over by dancers, young and adult. Everywhere you look, there are bunheads walking in groups - it's very cute! While young ballet students are the easiest to spot, all kinds of dancers have come here: jazz, modern, contemporary, flamenco, street. Choreographers, master teachers, artists. Dancers are here to perform or to take class, or do both. I've noticed that it's not unusual to have a mix of pros and amateurs in the same class, even though there are separate courses for professionals. I think it's great, because you get to see so many awesome dancers. Yeah, and I try to copy as much as I can. Always copy from the best! I came here to dance, but I also came here for the shows. Kuopio's emphasis is more on contemporary than classical ballet, very cool, but I also adore the classics - which is why I left Arja's class early today: to see the National Ballet School's performance. About 25 young dancers got on the bus at 5:30 in the morning, travelled 5+ hours, unpacked themselves into the venue, did a warm-up led by the school's Artistic Director Wilfried Jacobs, followed by a stage rehearsal, then a short break before the show. After the performance, they had a one-hour late lunch break before returning to Helsinki on the same day. It's a shame they could not stay longer. The whole city of Kuopio is buzzing with young students and dancers from all over Finland. 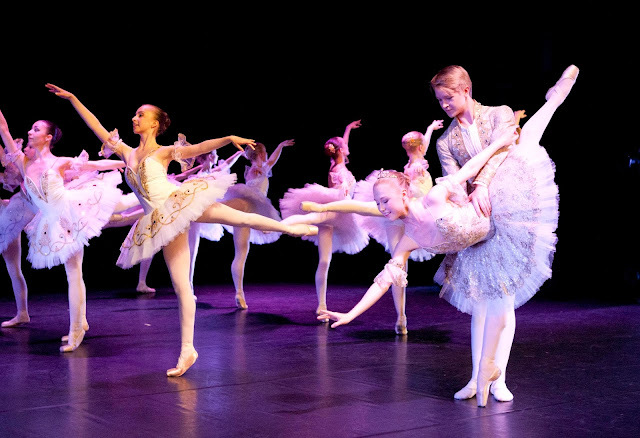 The National Ballet School's show brought first, second and third year pre-pro students onto the stage, beginning with classic Paquita. It's a ballet that demands clean and crisp technique and elegant presentation. You may not be able to spot technical flaws in a modern choreography, but classical ballet reveals all. While it was a student performance, I was pleased to see that it was very well rehearsed. The corps work was professional, all lines and formations in place, smiles never fading, eyes never dull. You can put a dancer in the prettiest tutu there is, but if her eyes are not sparkling, the magic is not happening (same applies for the male danseur, sans the tutu). It's something I'm still working on, to project the joy of dance, and not keep it all to myself. Some teachers tell you "to sell it," but I prefer to think of it as generousity. Be a generous dancer. It was also nice to see the progress of individual dancers. The boys are definitely getting better with their batterie in jumps, as there was more confidence in presentation. If I'd want to critique something: one of the boys "cheated" with his preparation for tours en l'air. He did a third of a turn while still in plié, which put his body at an odd angle to the audience. It was not the most elegant preparation, and it was repeated twice. Double tours en l'air are from easy, I struggle with single ones... But, his double tour had already nice elevation, and the preparation might have been off because of the different stage (not the best for jumps). Another technical issue that caught my eye (I sat in front row, at level with the stage): a multiple pirouette executed on quarter relevé instead of a full demi pointe, the kind you see in older ballet footage. I can't tell if it was a conscious decision, but I prefer seeing full relevés. It's in the details! Having said that, I must say this: hats off to the guys, they are making good and promising progress. Anyways, excellent technique alone does not yet a dancer make. It has to be interesting, and you want to see personalities on stage! Paquita. In the front: Sara Antikainen and Aapo Kokkonen (first year professional student). Photo (c) Kuopio Dance Festival. The girls provided their own highlights. Sara Antikainen danced the Grand Pas de Deux with Aapo Kokkonen (first year), and she was secure and sweet. The final fouettés were nailed with confidence, and even a tiny slip on the last step of her variation was handled with aplomb. Eliisa Nenonen danced one of the solos with charming confidence and controlled balances. Katerina Torp has also blossomed since I last saw her, both technically and in her presentation. She is a versatile dancer, I especially enjoyed her contemporary solo (chor. by FNB soloist Terhi Räsänen). She was also responsible for one of the show's group choreographies, a neo-classical ballet called "Light". I liked that there were no soloists, everyone had equal dance time. One moment I really enjoyed: when the girls piquéd onto arabesque, and their partners appeared from behind the curtains just at the height of their balances, taking hold of the girls' waist with perfect timing. One danc(er) I missed seeing: Erika Vilander in her own choreography "Helios". She has the most fluid way of moving, arms rippling as if underwater, unhampered by bones. It's a fusion of street and contemporary dance, something that I've seen a lot of here at Kuopio. While I love classical ballet, I find a fusion of styles more and more interesting. I've also realised that I want to do more than ballet! The contemporary piece by Jouka Valkama ("Legioona") could also have been shown at the festival's gala performance. The choreography was interesting... A "legion" of masked dancers, which had a eerily distancing effect, not being able to see their faces. Then the contrast, when masks were removed and human faces revealed. I looked at is as a discourse between the individual and anonymity of a technologized society. But, hey, that's just my personal interpretation. What I liked: it was danced with intesity and conviction. The last class (third year) has already graduated, and this was their last performance with the school. I can only imagine how they must have felt, taking those last steps as students. At least one of the girls, Sara Antikainen, has secured herself a contract with the company, but I don't know about the other graduates. I expect that some will look for work with contemporary ensembles, and I trust that many will succeed. What I saw today, were mature artists, ready to enter the professional world. I wish them all the best, and an exciting and fulfilling career in dance! Taking their bows. Photo by me. There's so much happening here, I can barely keep up - but I'm loving every moment! Going from dance class to shows, having my cake and eating it too. I have a lot more posts coming up, about classes and shows and new ideas. Coming very soon!